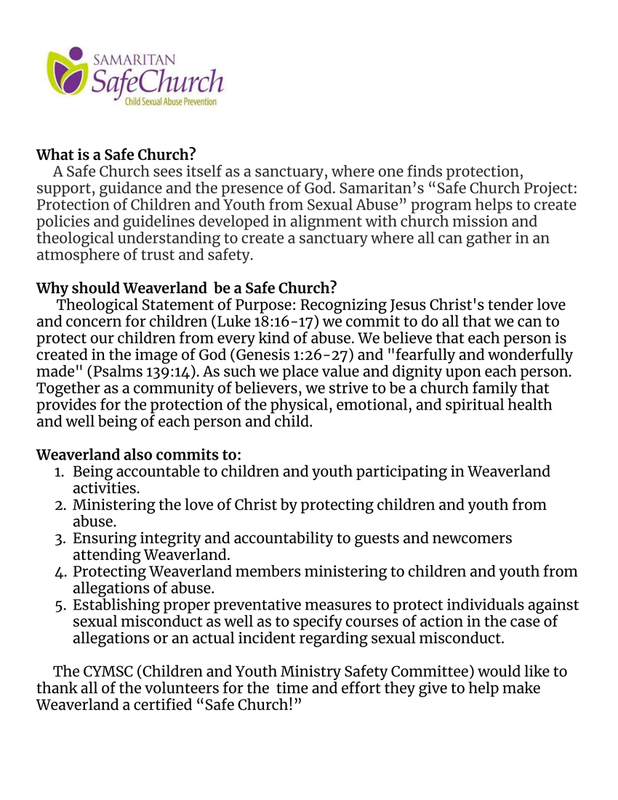 Weaverland has received Safe Church certification. A Safe Church sees itself as a sanctuary, where one finds protection, support, guidance, and the presence of God. Read more about Safe Church below. What’s in a name? If your answer is, Everything! then you answered correctly. Names are very important and your name and nicknames reveal something vital about you and your identity. This Advent Season we want to immerse ourselves in the names of God in order to grow in our appreciation of God’s redemptive character and purposes. 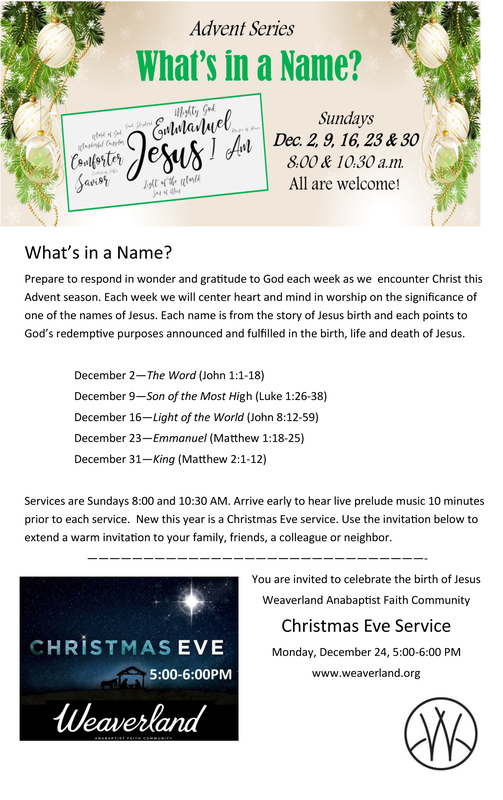 Sunday morning messages in December will center on the names ascribed to Jesus in the Gospel narratives. 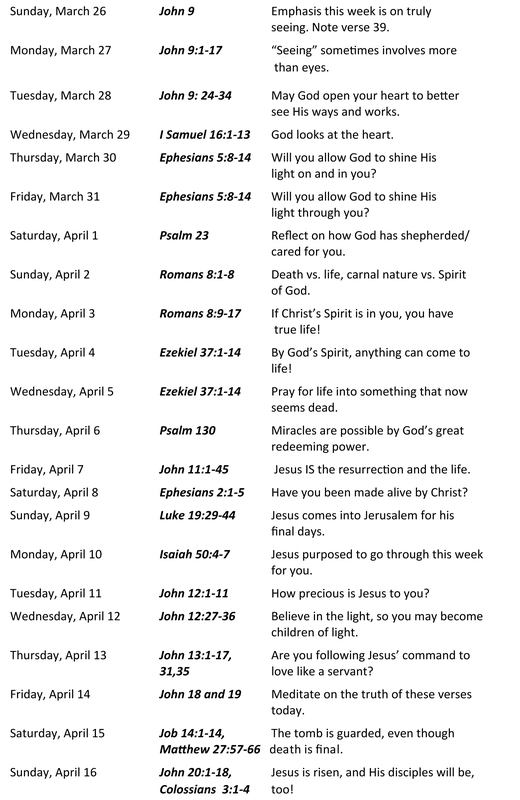 A Daily Devotional is also available for our instruction which can be downloaded HERE. Each day a portion of Scripture highlights a unique name of God followed by a prayer. And new this year, we will be having a Christmas Eve Service on Dec. 24 from 5:00-6:00 p.m. Come and celebrate the season with us! 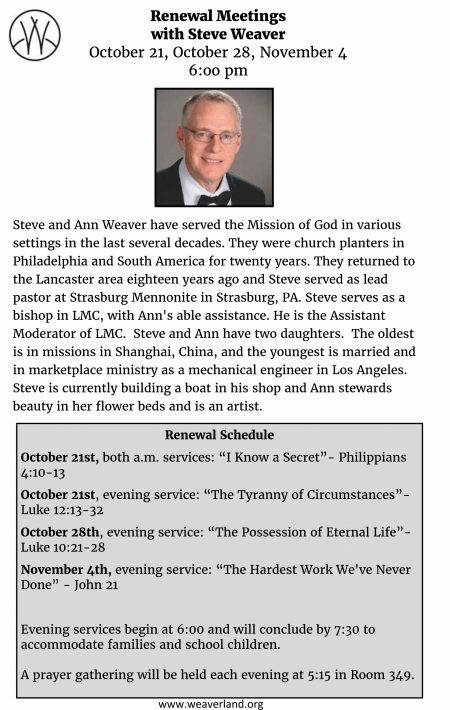 Everyone is invited to Renewal Meetings with speaker Steve Weaver beginning Sunday morning, October 21, during the 8:00 and 10:30 a.m. services, and continuing Sunday evenings at 6:00 p.m., October 21, 28, and November 4, 2018. The first of these is a call to observe … look where God is at work around you. The second is a way we can respond … revive us, make it happen here and now. Beginning October 16 through the day following Thanksgiving, we are inviting you on a 40-day prayer journey together as a church family in pursuit of God – His face, His presence, His will, and His power. This devotional guide is a tool to help us stay focused on Jesus and the road he’s set before us. This prayer focus also complements our upcoming renewal services with Steve Shank which begins Sunday morning October 22, and continues at 6:00PM on October 22, 29, and November 5. 2. You can’t do it alone. You need mentors, friends, and other believers to partner with in expanding God’s kingdom. Ask God to bless you with a mentor and friends that can help guide and encourage you. 3. You’ll face temptation. Expect resistance. Meet it with prayer. These readings are intended for personal and family use. Each week beings with an introduction followed by five daily readings and prayers—Monday through Friday of each week. Please find a way to incorporate this into your daily rhythms and conversations. We can’t wait to see what God has in store for us! 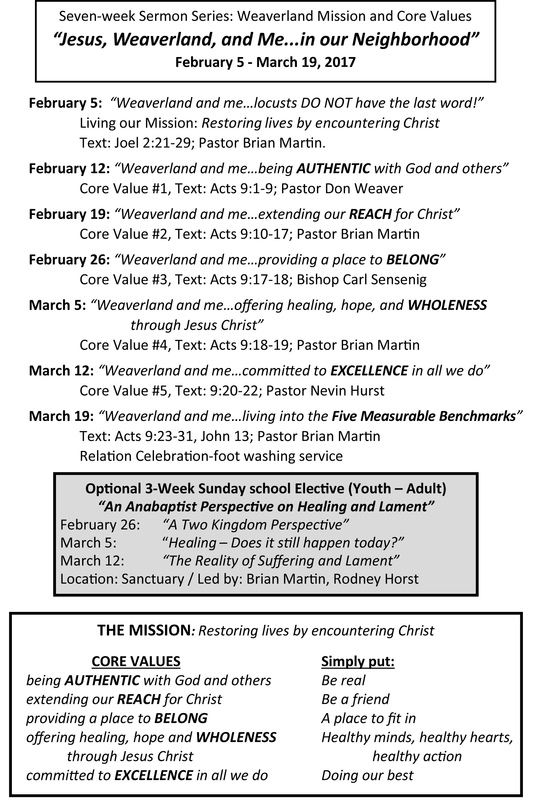 We are grateful to Wes Furlong (our renewal speaker last year) for his development of this 40-day prayer challenge and invitation by sharing it with us. We invite you to join us. With expectation, believing as we pray—God moves. 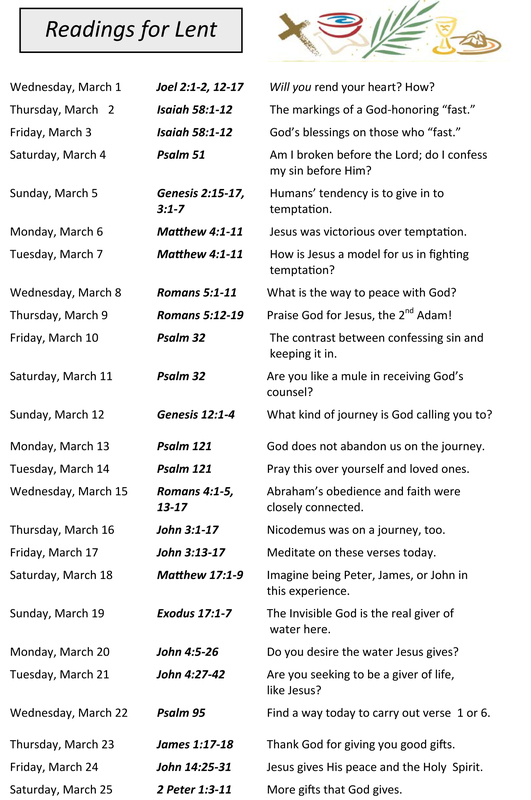 We offer this guide for focused Bible reading throughout the Lenten season, which begins March 1 and ends with Easter Sunday, April 16. Each day has a Bible passage to read and a questions or statement to consider. Reading the passage for each day several times, or perhaps selecting different translations may help to make this more meaningful. To download the guide as a PDF, click here. 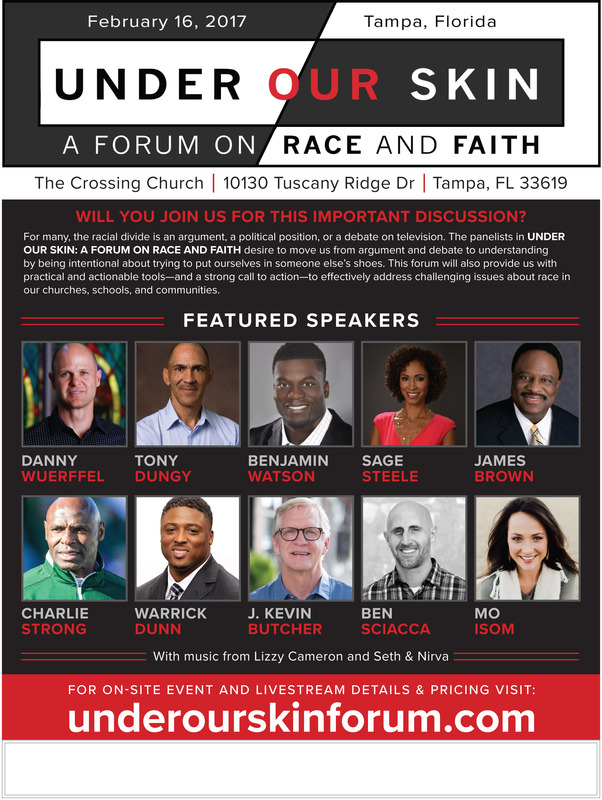 Everyone is invited to a discussion with thought leaders on Race and Faith, on Thursday, Feb. 16 from 7:00-10:00 p.m. at Weaverland Mennonite Church. The live event takes place in Tampa, Florida, but will be live streamed at Weaverland. The discussion encourages positive response instead of fear or panic tactics. Event is free and open to the public. For more information about the event, go to the event webpage here. 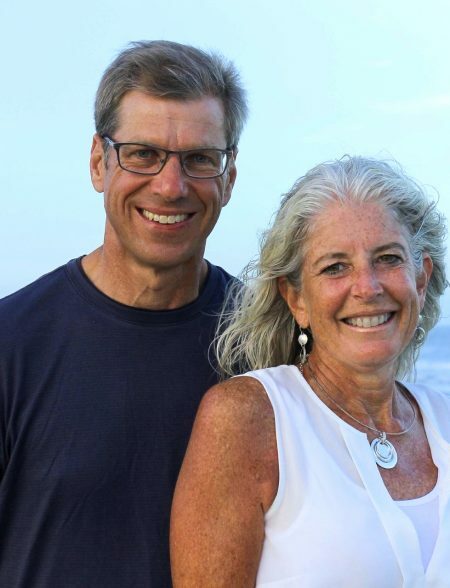 Facing Cancer or Chronic Illness? Are you supporting a loved one with either, or lost a loved one to either? Need support? 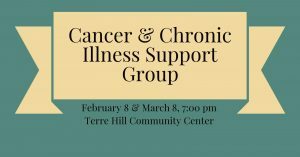 Join us for an informal evening on Wednesday, February 8 and March 8, 2017 at 7:00 p.m. at the Terre Hill Community Center (131 W. Main Street in Terre Hill). Listen to stories, be encouraged, receive tips for caregivers and practical advice for anyone navigating this journey. Refreshments will be provided. Prayer requests may be submitted to a prayer team. Share needs that could be met by the Support Team. Come or bring someone you know who needs support! Questions? 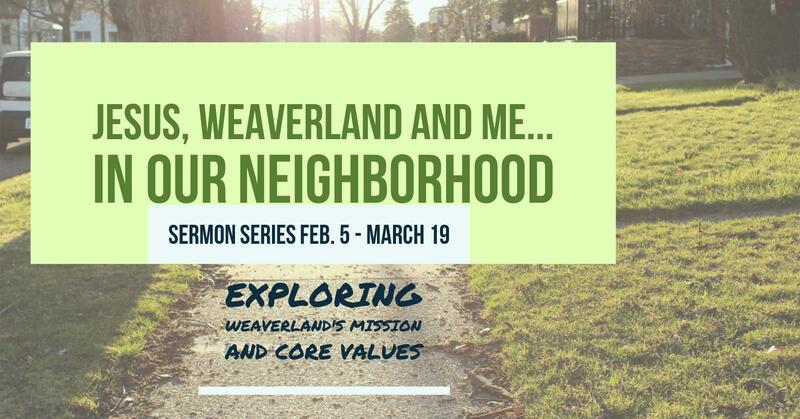 Contact Rodney Horst, Weaverland Mennonite Church, 717-989-0670 or rodneyhorst@weaverland.org. Everyone is invited to a Christmas Dinner/Community Meal in the church fellowship hall on Sunday, December 11 at 5:30 P.M. This is a time for us to celebrate God’s gift to us, and to share it with others. Everyone is welcome who may need some Christmas cheer! Please invite family and friends. If you attend WMC, please bring a large hot and cold dish to share. The evening will consist of good food, games and music. Hope to see you there!